The death of Rushden and Diamonds goalkeeper Dale Roberts on Tuesday at the age of 24 is not being treated as suspicious, police have said. It is yet to be revealed how the former Nottingham Forest player died. A report has been prepared for the coroner. Rushden and Diamonds opened Nene Park on Wednesday for fans to pay tribute to the player, who was found at his home in Higham Ferrers, Northamptonshire. Roberts joined Diamonds in January 2009 and was an England C international. Prior to that he had loan spells with Eastwood Town and Alfreton Town. Rushden and Diamonds' FA Youth Cup tie at Hull, which had been scheduled for Wednesday evening, was postponed following the death. 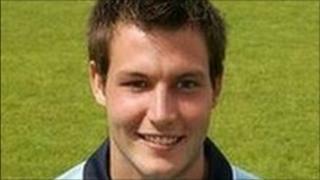 The goalkeeper's fiancée, Lindsey Cowan, described him as "my childhood sweetheart and the love of my life". In a separate statement, the footballer's parents, Isabelle and George Roberts, said Lindsey and their son had been very happy together. Mr and Mrs Roberts added: "We are grieving for our wonderful son Dale. "We are devastated by his death." In her statement, Miss Cowan said: "We had been together since a young age and I will never get over his death."